The 2018 Indian® Roadmaster™ reflects pure American Luxury. Building upon the iconic Roadmaster name used by Indian in the 1940s, the new Roadmaster reimagines Indian Motorcycle comfort, styling and performance out on the open road, for the long haul. Horizon Power Windshield Adjust this new Horizon Power Windshield with push-button adjustability to customize airflow, provide weather protection, and reduce glare. Storage Over 37 Gallons of weatherproof storage in the convenient saddlebags, roomy trunk, lowers, and fairing including convenient front storage in the lowers that’s easily accessible to the driver while riding. Heated rider and passenger seats with individual controls and high and low settings. 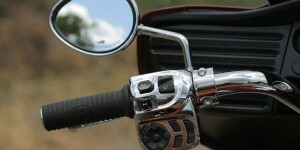 Adjust heated grips for the right temperature with ten settings. Adjustable Passenger Floorboards Give your passenger the ultimate riding experience and leg room comfort with adjustable floorboards. The Thunder Stroke® 111 engine delivers an incredible 150 Nm of torque and features styling that pays tribute to legendary Indian Motorcycle® engines of the past. Pathfinder LED Lighting Headlight, fog lights, turn signals, taillight, and even the front fender War Bonnet provides the brightest, more reliable lighting. The comfortable rider and passenger seat feature genuine leather designed to withstand the elements.This sealed, high-quality leather is strong and durable, and it complements the traditional Indian Motorcycle® style. Over 37 Gallons of weatherproof storage in the convenient saddlebags, roomy trunk, lowers, and fairing including convenient front storage in the lowers that’s easily accessible to the driver while riding. The comfortable rider and passenger seat feature genuine leather designed to withstand the elements. This sealed, high-quality leather is strong and durable, and it complements the traditional Indian Motorcycle® style.